Best solutions for locating geomembrane leaks, contaminant plumes and other subsurface environmental impacts always involve geophysics. in their ability to provide abundant information using non-invasive, minimal-impact technology. Unlike limited, single-point data obtained from bore holes, geophysical methods can provide rich imagery of large areas— including between drill holes—at a fraction of the cost, and without the destructiveness of drilling. 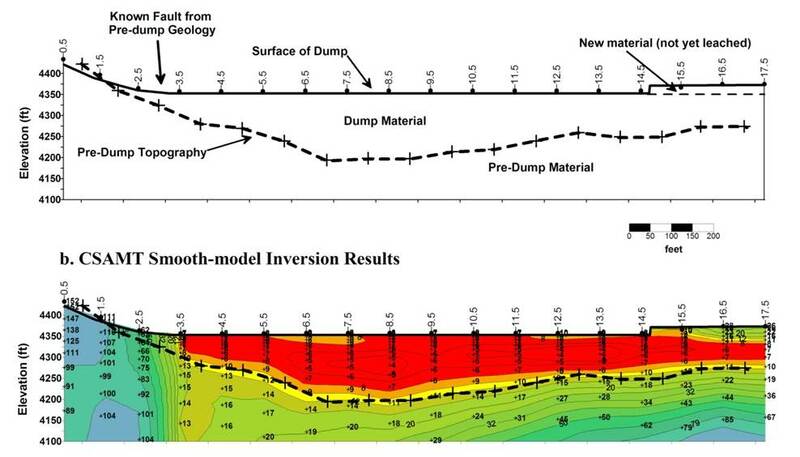 Geophysical methods are effective at locating buried hazards, landfill limits and liner leaks, and are often engaged for these purposes. 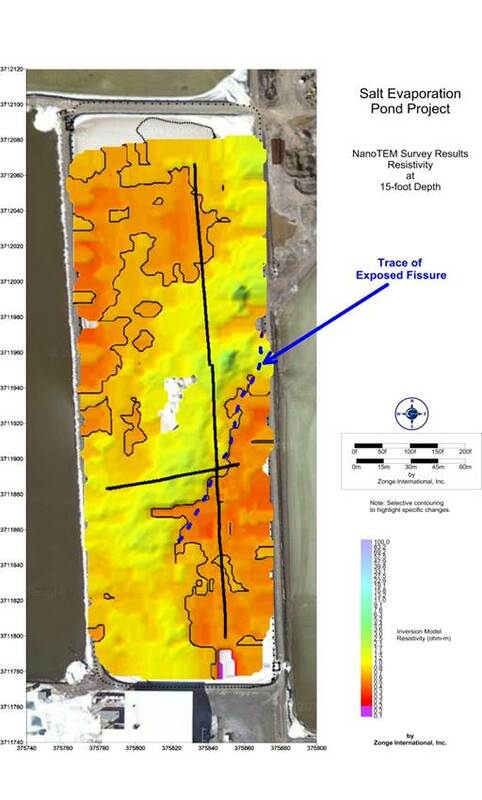 But in addition to determining the extent of an existing problem, geophysical services can enable knowledgeable, preventive planning from the onset of a project. 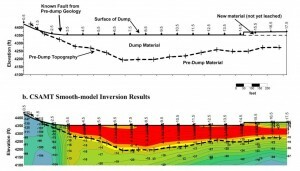 Cost-saving geophysics technologies are available to monitor ponds, heaps, and tailings dams for mining, power generation and other industries. With these technologies, operators and contractors have at their disposal a reliable picture of the geology and the ground properties that affect stability, contamination pathways and migration trends. 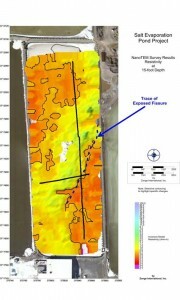 Monitoring and mitigation efforts can take into account the subsurface reality. Left: A pseudo 3D image of CSAMT data used to monitor an in-situ copper mining site. Black dots indicate data-collection station locations with plumb lines projected to depth. Subsurface area less than 20 ohm-meters in resistivity — interpreted to be copper-bearing pregnant leach solution (PLS) — is enclosed and shaded.